I’ve said before that I love road trips, and this was one of the sillier ones I’ve ever done. Think of it as an 1850 mile out and back driving course, punctuated in the middle with a 5k out and back running course. In fact, I only spent about seventeen hours in Philadelphia, while I spent about twenty-eight hours on the drive itself. Leaving Thursday after work, I got to Philly late on Friday, and arrived at Lloyd Hall to pick up my packet with an hour or two to spare. Frankly, I was surprised at the packet pickup. It seems like many, many races I run have some kind of health expo at the packet pickup site. It’s a chance to pick up things you forgot (like gloves, for me on this trip), as well as supplies like Gu and Sports Beans. Here, it was packet pickup, and that was pretty much it. It made things quick, though! I got to the hotel after a little exercise in one way streets, was checked in, and landed squarely on the couch to rest a bit. I flipped on the TV to find something silly to relax with. And that’s when I heard about Paris. I’ve bled myself off the news. There’s so much awfulness in the world reported a 24×7 basis, and this incessant blast of bad news has had an awful impact on me. So, I elected months ago not to watch the news (aside from CNBC — that’s just playing with numbers all day, and is entertaining to my inner math geek). I don’t need to recount the atrocities that unfolded on Friday night, but needless to say, Paris was on my mind all night. 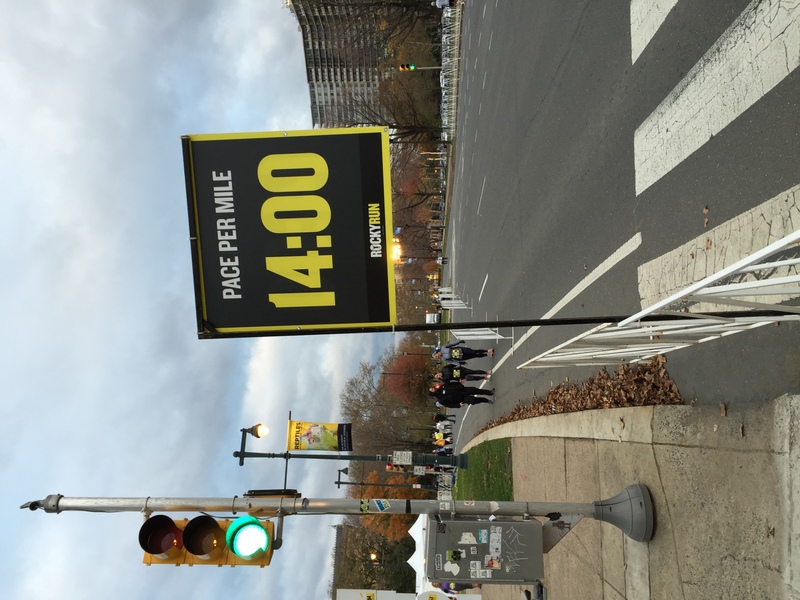 I got up early, and started my race morning routine, knowing that I had about a mile to walk to the race site. I got dressed, and headed toward the Philadelphia Art Museum. As usual, I arrived at the race site early, and got to watch the crowd filter in. There were all kinds of Rocky’s, Hulk Hogan’s and other costumed characters showing up, all ready to take on the courses. Folks milled around, while the DJ worked on getting everyone up for the race. 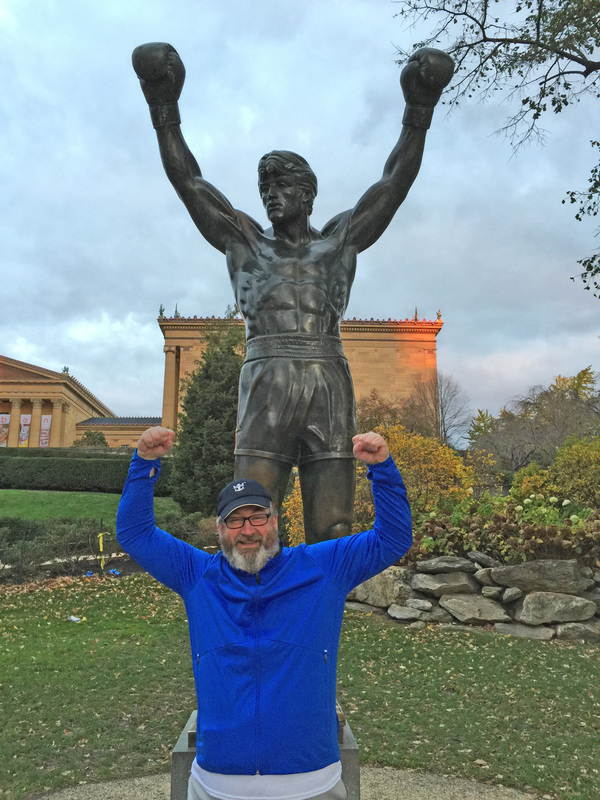 I knew I had to go over to the Museum, and take my picture with the big statue of Rocky. It’s a pretty cool process. You stand in line — about twenty folks deep when I showed up — and hand your camera to the person behind you in line, and they take your photo. And this goes on and on until everyone’s done. Pretty cool. We started lining up for the 5k, by corrals. And as we all stood there in our running gear, it was hard not to think of Paris, standing in one of America icon cities at a large event that could be thought of as a “soft target”. That’s probably the first time I’ve ever felt a little nervous like that at a race. We stood, and the singer began belting out the National Anthem. I don’t think I’ve ever heard it sung so boldly. And man, did he have some sustain!!! After a couple of four minutes “waits” for waves to get off the line, my wave — the final one — finally got going. And what a throng of folks! There’ve been plenty of races I’ve done around here where the entire group of race participants didn’t equal the number of folks in my wave. I couldn’t believe the mass of humanity in front of me as we took off. In fact, starting eight minutes behind the leaders, we starting passing them on their way back just a few minutes into our run. Normally, that’d be a little disheartening, but I was having a great race. And in this race, I ran about 90% of course, which is big for me. Something just clicked, and I found a great pace to hold through most of the course. I hope that happens at Tulsa next weekend! 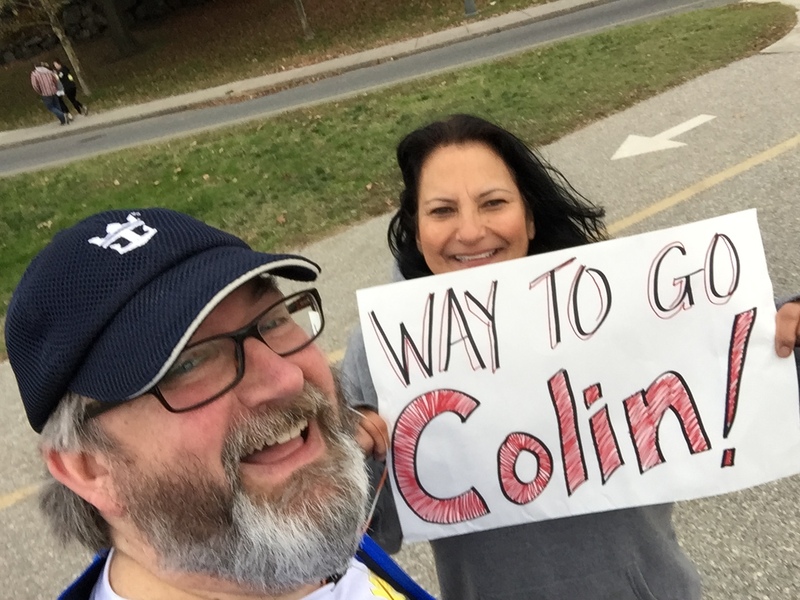 Just before the finish, I saw someone holding a sign saying “Way to Go Colin!” I told her my name was Colin also, and I took a quick selfie. The other Colin finished about 15 seconds ahead of me. And with 1850 miles of driving, I encountered some weird driving stuff. In Ohio, I encountered a line of what we call out here “gang plows”. This is when the snow plows stagger, lane by lane, pushing the snow from lane to lane at high speed. I have no idea why these plows were out, but their blades were painted. One had The Hulk, and others had other characters and scenes. Also in Ohio, there was a highway information board touting the number of fatalities on the road this year. The next screen on it said “Focus on driving”. Kinda ironic, eh? I’ve also figured out that the folks in Philly don’t know how to merge. Every traffic delay I encountered either entering or leaving Philly had to do with the fine art of merging. That was pretty ugly. So, it wasn’t a PR — although it was close — but it was a very successful trip and race. I was really pleased with my run, and how close I came to running the whole distance. What an amazing improvement over this season! 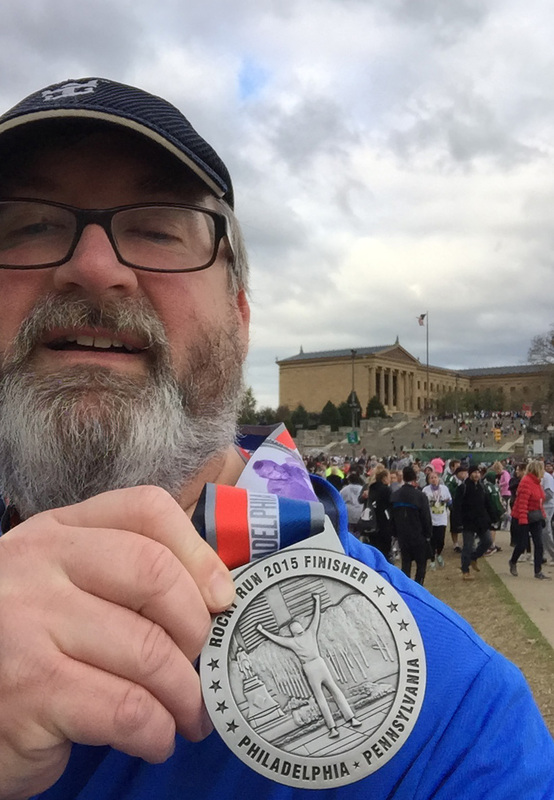 This race benefitted Special Olympics Philadelphia.